Historically, dendrites were often assumed to be passive structures which simply acted as a collection hub to sum sensory inputs and relay the information to the cell body. It is now well established that dendrites themselves play an active role in processing sensory information by modifying neuronal input. The active properties of dendrites turn out to be extremely important for the processing of sensory input and can by themselves determine which sensory information is relayed to neighbouring cells. 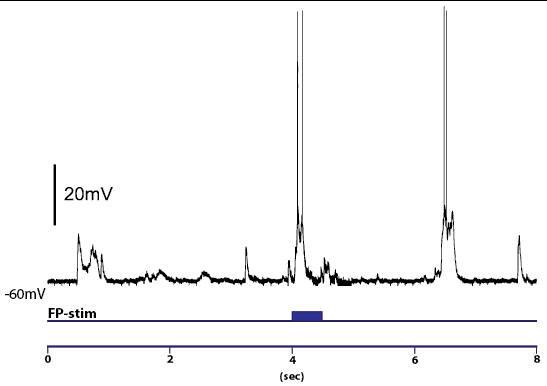 For example, we recently showed that dendrites are able to generate large non-linear NMDA-receptor dependent voltage events called NMDA spikes in response to sensory stimulation. These dendritic spikes can have a very powerful effect on neuronal output and therefore they can strongly influence sensory processing and behaviour. We are currently investigating the conditions during which dendritic spikes are initiated, how they are modulated and whether they contribute to neuronal signalling during sensory perception. During daily life, the brain encounters many situations; some of which are new and others which have been experienced before. To survive in this ever-changing environment, the brain must pro-cess this information and assess the importance and/or risk of both the expected and unexpected events. We are investigating dendritic activity during the presentation of different sensory stimuli to assess the cellular mechanisms which encode sensory perception. A fundamental goal of neuroscience is to understand how sensory experiences arise from activity in the brain. This is no easy feat, however, as it requires an intricate understanding of how neurons build an internal representation of the external environment from digital information received from other neurons. We are investigating how this sensory information is encoded in neurons, with a particular focus on whether this information influences the integration of synaptic input in dendrites. The brain has many areas specialized for specific functions which must communicate with one another to generate an internal representation of our environment. When assessing brain activity, one must consider the micro-circuitry underlying the functional connectivity of the various brain regions. Since synaptic input generally occurs onto the dendrites of neurons, understanding this micro-circuitry requires detailed analysis of dendritic activity during the activation of different brain regions. We previously illustrated the role of slow GABAB-mediated inhibition of dendritic activity in the communication between the two cortical hemispheres. However, it is not known whether communication between different sensory cortical regions within the same hemisphere is also mediated by inhibition or whether excitatory connections dominate inter-cortical communication.